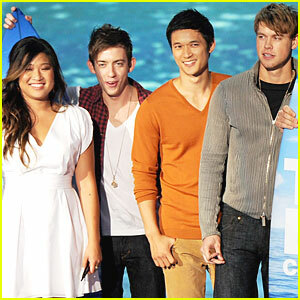 Glee actors Chord Overstreet, Jenna Ushkowitz, Kevin McHale, and Harry Shum, Jr. hit the stage at the 2011 Teen Choice Awards, held at the Gibson Amphitheatre on Sunday (August 7) in Universal City, Calif. The cast picked up the surfboard for Choice Comedy at the show! 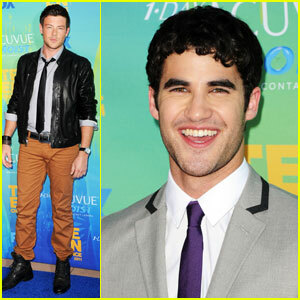 Joining the gang on stage were cast members Darren Criss, Cory Monteith, and Ashley Fink. If you can’t get enough of the show, be sure to check out Glee: The 3D Concert Movie, in theaters this weekend! FYI: Jenna is wearing a Callula Lillibelle dress, Casadei peep toe pumps, a Judith Leiber clutch, and Bavna and Isharya jewelry. Harry is waring Aldo shoes.